During the weekend of June 28-29, Orthodox believers converged on the Cathedral of our Lady "Joy of All Who Sorrow" in San Francisco, CA for the celebrations commemorating the 20th Anniversary of the Glorification of St. John the Wonderworker of Shanghai and San Francisco. 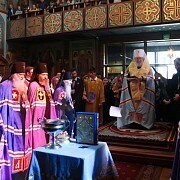 On Sunday, June 22, the Second Sunday after Pentecost commemorating All Saints Glorified in the Russian Lands,with the Blessing of His Eminence Hilarion, Metropolitan of Eastern America and NY, First Hierarch of the Russian Church Abroad, the Administrator of the Patriarchal Parishes in the USA, His Eminence Justinian Archbishop of Naro-Fominsk, celebrated the Divine Liturgy in St. Vladimir Church in Miami, Florida. 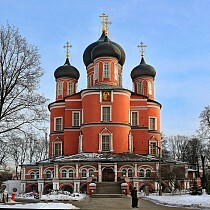 His Holiness Patriarch Kirill of Moscow and All Russia blessed a special prayer for peace and the overcoming of internecine strife in Ukraine to be offered in all churches of the Russian Orthodox Church. 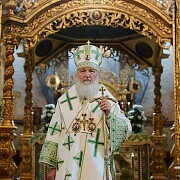 On the Sunday of All Saints, June 15, 2014, the Administrator of the Patriarchal Parishes in the USA, His Eminence Archbishop Justinian of Naro-Fominsk preformed an Archpastoral Visit to St. Gregory Church in Tampa, FL. On Thursday, June 12th, 2014, the Konevets Quartet from St. Petersburg, Russia, performed a concert at St. Michael the Archangel Church in Redford, Michigan. 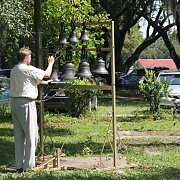 The concert was jointly sponsored by St. Michael Church, and neighboring St. Innocent Church. 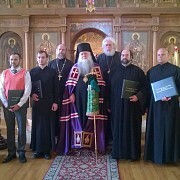 On the weekend of July 15, 2014, Reader Nicholas DeGraaff of Three Saints Church, Garfield NJ graduated from the Orthodox Pastoral School of the Diocese of Chicago and Mid-America (ROCOR). On Tuesday, June 10, 2014 a meeting of the committee chairmen of the Assembly of Canonical Orthodox Bishops of North America and the Assembly’s Committee for Canonical Regional Planning was held in the Headquarters of the Greek Orthodox Archdiocese of America in New York City. On Sunday, June 8, 2014, clergy and faithful of the Patriarchal Parishes in the USA prayerfully commemorated the Feast of the Holy Trinity - Holy Pentecost. The editors of the website sincerely greet its readers with the Feast! 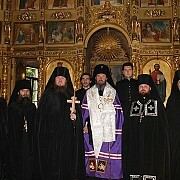 On June 5, 2014, His Eminence Archbishop Justinian of Naro-Fominsk, Administrator of the Patriarchal Parishes in the USA, performed the monastic tonsure of Archpriest Viktor Mikheikina, Bishop-Elect of the Diocese of Petropavlovsk and Bulaevsk.